Awareness about policies and entitlements they are eligible to are low among people in India’s heartlands. Some 63% of people surveyed using Mobile Vaani in Raipur, Chattisgarh, didn’t know how to enrol in the National Social Assistance Programme, while 52% didn’t know if they were getting their due amount under PM Awaas Yojana. Over 1 in 3 didn’t know if they had to pay for medicines in public health facilities. 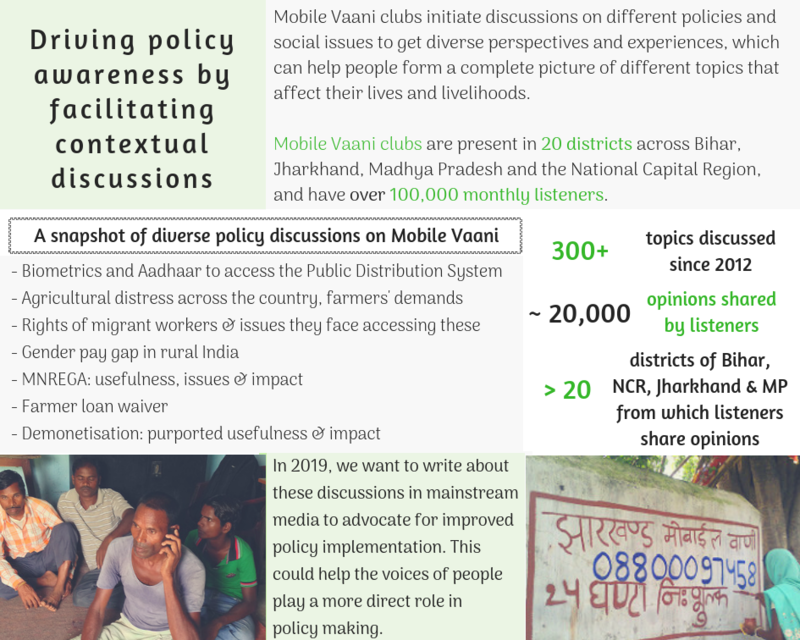 Mobile Vaani clubs initiate discussions on policies and social issues to get people’s perspectives and experiences, to help them form a complete picture of issues that affect them. We want to write in mainstream media about these discussions to advocate for improved policy implementation by bringing the voices of people to play a more direct role in policy making. Please write to us at contact@gramvaani.org/ to know more.